As the founder and editor of American Sweeper magazine, in 1995 our editor, Ranger Kidwell-Ross, began the tradition of recognizing outstanding individuals in the sweeping industry. Through the intervening years the honor, called the Award of Excellence in Power Sweeping, has become the top distinction in the world of power sweeping. Says Kidwell-Ross, "The World Sweeper / World Sweeping Association Award of Excellence in Power Sweeping continues a tradition I began in 1995. This was spurred because I had won, the previous year, a national APEX Award for Publication Excellence for my American Sweeper magazine. This motivated me to start a similar award for the power sweeping industry. Through the intervening years the Award has been received by a notable 'Who's Who' list of dedicated, involved companies and individuals in the power sweeping industry. The Award qualifications, which include more than just success in the sweeping industry, encompass time devoted to building professionalism in the industry and in assisting others involved in sweeping." In 2005, American Sweeper magazine transitioned into this WorldSweeper.com website, which resumed this tradition." This is the place on the expansive WorldSweeper website where you may read about the current recipient of this special Award, as well as information about other winners in past years. Starting with the 2014 presentation, the Award has also been co-sponsored by the World Sweeping Association. Bridget and Warren Burge and their company, Clean Sweep, Inc., won the 2019 WorldSweeper.com/World Sweeping Association's Award of Excellence in Power Sweeping , the United States power sweeping industry's highest honor. 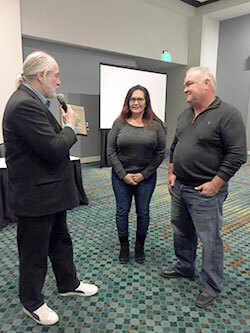 At the National Pavement Exposition, held in Nashville February 26th – March 2nd of 2019, the WorldSweeper.com/World Sweeping Association's Award of Excellence in Power Sweeping was awarded to Bridget and Warren Burge of Baton Rouge-based Clean Sweep, Inc. The photo shown below was taken during the award ceremony. The following is a brief video of the presentation ceremony, which was held at the conclusion of the Contractors Roundtable at the 2019 National Pavement Exposition. The presenter was Ranger Kidwell-Ross, Editor of WorldSweeper.com and Director of the World Sweeping Association. Below the YouTube link is the wording of the presentation. In 1990 a couple living in Baton Rouge, Louisiana, purchased a new 347-I parking lot sweeper from Schwarze Industries' Tommy Allen. Suddenly, they were in business. After experiencing steady growth as a sole proprietor company, in 1997 they recognized the need to incorporate and did so as a woman-owned company, Clean Sweep, Inc. The firm has since grown to where today the company owns and operates a fleet of 30 vehicles, 25 of which are sweepers. They are a major force in Louisiana sweeping and pavement maintenance, where they sweep warehouses, construction sites, city streets and, yes, still continue to sweep parking lots. In addition, they have become a 'one call does it' company for virtually any type of pavement and exterior maintenance, including infrared asphalt repair. There are no required national standards for power sweeping. However, Clean Sweep adheres to the top ethical values promoted by the sweeping industry. The firm is a Founding Member of the World Sweeping Association as well as a founding adopter of WSA's industry-leading Ethics in Power Sweeping Initiative . The company is also the first – and still the only – Louisiana contractor to become NAPSA-Certified. The owners have contributed mentoring to others as well as have contributed information about best practices to follow as a sweeping organization. This has included a presentation at the National Pavement Exposition about the value of providing more services than sweeping, a fascinating overview of how sweeping is conducted in Jamaica, where they maintain a home away from home and have consulted with the Jamaican government on sweeping best practices. In addition to serving on the Advisory Board of the World Sweeping Association they also were one of the presenters at WSA's 2017 Sweeper Roundup. Finally, they were also the instigators, hosts and guides for my trip to Mardi Gras some years back that resulted in me receiving a rare invitation to be onsite when the clock struck midnight on Fat Tuesday. This resulted in a fascinating article entitled "Sweeping Up After Mardi Gras." Their 29 years of operating a sweeping and maintenance company have not been without difficulty. In August of 2016 their office, as well as virtually their entire market area, underwent a catastrophic, 1,000-year flood – imagine, if you can, getting 30 inches of rain overnight. That resulted in their office being completely flooded as well as in the loss seven of the company's sweepers. Throughout many months of having to cope with this catastrophe to not only themselves but to the majority of their customers, they emerged on the other side, stronger and more professional than ever. Perhaps the strongest indicator of professionalism and class of these individuals, though, is the fact that the winners of this year's Award of Excellence were divorced in 2014 and yet have continued together as business partners and friends to keep growing their company. At this time it is my great honor to present the WorldSweeper.com/World Sweeping Association's 2019 Award of Excellence in Power Sweeping , the United States power sweeping industry's highest honor, to Bridget and Warren Burge and their company, Baton Rouge's Clean Sweep, Inc.
For more information about Clean Sweep Inc., we invite you to visit the company's website, which is located at www.cleansweeponline.com. The company's phone number is 423-877-9192 and you may contact them via email sent to info@cleansweepinc.com. Winner for 2016, Larry Dyck, founder of MASCO Sweepers. Winner for 2015, Les Huliscko, founder of SweepRite Sweepers. Winner for 2010, Allan Heydorn, editor of PAVEMENT Maintenance & Reconstruction Magazine. Winner for 2009, South Carolina-based Dale McCaskill and his company, Southco Sweeping. Winner for 2008, Seattle-based Davidson-Macri Sweeping and SweeperMarket Magazine. First Award Winner, Gabriel Vitale, owner of C and L Sweeping in New Jersey. Winner for 2006, Gale Holsman, owner of American Sweeping, Inc. in Kansas City, Missouri. Eugene Hansen, the founder of Minnesota-based Clean Sweep, Inc.
Mark Carter, co-owner of Los Angeles-based Bill's Sweeping. Bob Schwarze, founder of Schwarze Industries, Inc., and his son, Mark, were the winners for 2002. Winner for 2018, Michael Nawa, founder of Pennsylvania-based Custom Maintenance. Winner for 2017, Pete Phillips, founder of Chattanooga-based Clean Sweep. Winner for 2013, Karl Stauty and his company, Commercial Power Sweeping, Inc. Winner for 2012, John "Johnny D" Dubbioso. John's companies include NE-based Tri-State Industrial Maintenance, Three-D Equipment Rebuilding and several others. He was also one of the inventors of the Broom Bear sweeper, which was sold to Elgin. Winner for 2011, Ray Confer of Michigan-based C & J Sweeping, Inc. In 2007, the WorldSweeper.com Award of Excellence in Power Sweeping was awarded to the B.W. Young family and the company he founded, The Young Manufacturing Company -- better known in the sweeping industry as the TYMCO sweeper company. Tom Ostuni is a man who in 1966 looked at an industry in its infancy and saw its potential. He took a single sweeper and a single account and turned it into a full-scale success, helping many others along the way.